Chef Jaime Guerrero has a dream of opening a fully sustainable restaurant in the Old Irving Park neighborhood of Chicago. 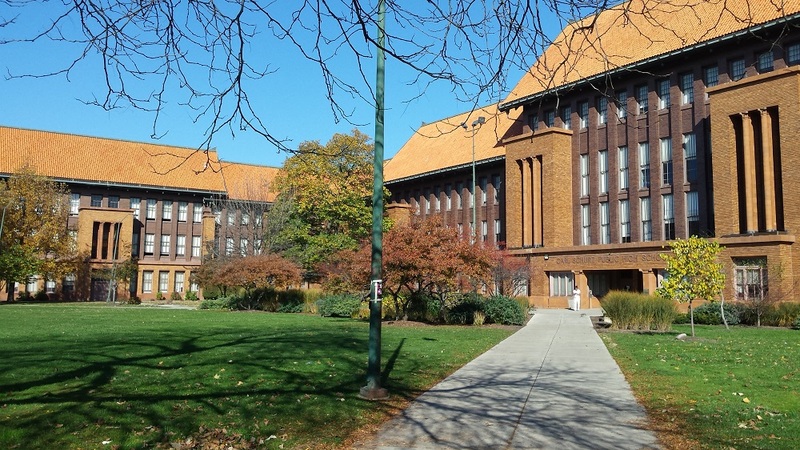 To refine that model, he’s turning to an unlikely partner: Schurz High School, located almost literally in his Old Irving backyard. “Imagine that you have a restaurant where everything you eat is grown, farmed, harvested, crafted or brewed in that facility,” he says of the restaurant that he hopes to open by the end of next year. But first he needs to perfect the indoor vertical farming model, which is the task he has put before Schurz students working in the new Food Science Lab. The lab is housed in a 105-year-old classroom that used to host industrial arts classes. But today the white-tiled room, capped with a large glass skylight, is filled with white trays and towers that are expected to be filled with lettuce, herbs and microgreens by the end of the year. On a recent morning, lab organizer Cyd Smillie was setting up the space for a fundraiser for the last key element in the lab: LED grow lights. The fundraising continues here. Smillie lives in the area and works for Ald John Arena’s (45th) office. The Schurz program hopes to certify all of its students as trained food handlers. And Smillie says the lab will serve as a classroom for several AP and International Baccalaureate science classes. But she also notes less obvious uses for the program and lab. These include use as a therapeutic space for students with low-level autism and as a business project for classes in entrepreneurship and marketing. The school’s JROTC program has also gotten involved. The group is working with a volunteer organization called Build Up, which will help distribute the produce to area food pantries. But Smillie says she hopes that one day the students will get to incorporate it into school food. Principal Dan Kramer has embraced the program as a way to help restore the place of schools in communities. Smillie says that, if they can refine the model, it won’t just help launch Guerrero’s restaurant but many more food labs across the city.